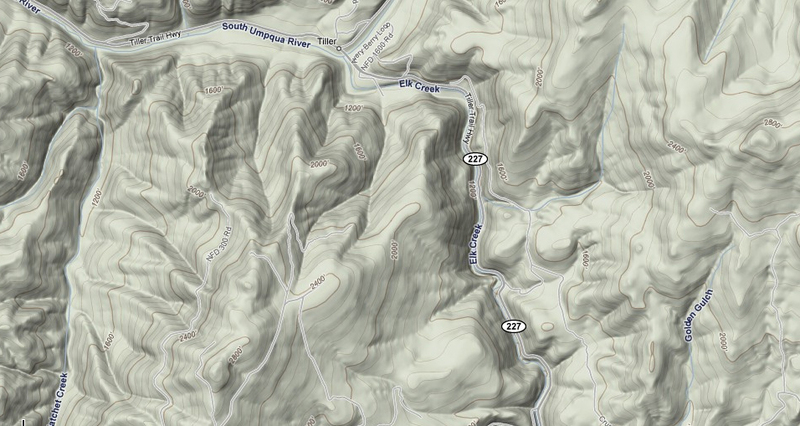 We had originally come down the South Umpqua drainage to run the Black Rock Fork again, but after getting denied by snow we did an exploratory on Upper Upper Jackson. We camped near the take out on Jackson Creek and the following Sunday morning we ran lower Jackson, which was also fun and worth doing again after so many years. On the way home we still had plenty of daylight, and Pete started talking about Elk Creek. 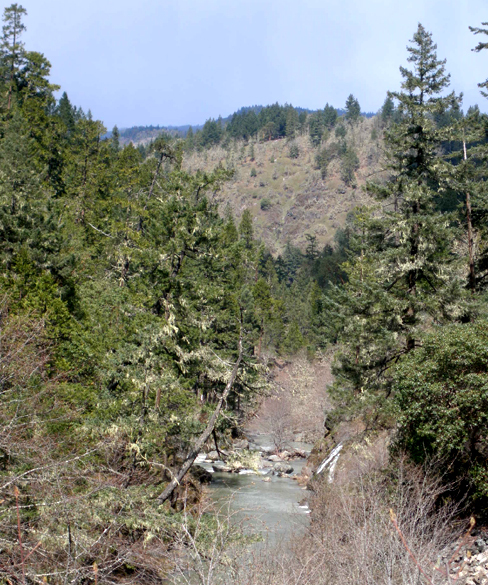 Elk is a tributary of the South Umpqua that you drive past on your way upriver, and it had always been of interest. When we got to Tiller we turned and drove up Elk, and it did look intriguing. Almost immediately, the road ran away from the creek, which is often a good sign. Generally, the more the road runs away, the steeper a run will be. 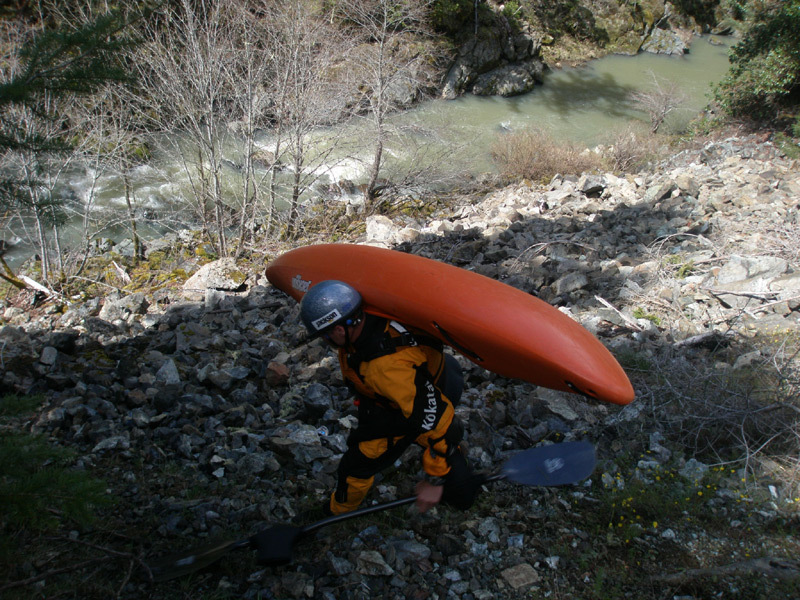 Finally we reached a spot a couple of miles above Tiller where there seemed to be reasonable access down the steep walls lining the creek, and we geared up. The descent down the scree slope when smoothly and then we were on the creek. The water was a little murky and had a slightly funky smell to it, not sure if there is some agricultural land upstream? Jesse Coombs climbing down to the put in. Nice scenery just below where we put in on Elk Creek. Below the put-in were some small, easy rapids, nothing too significant. 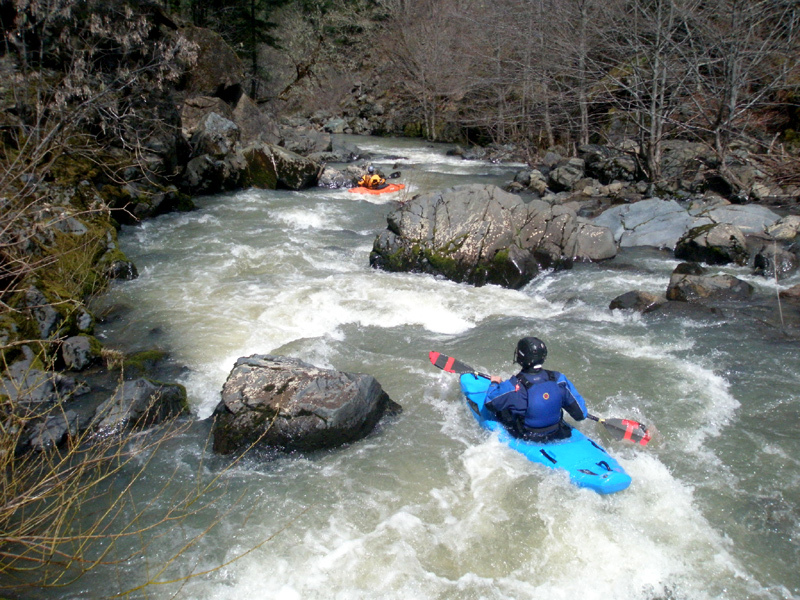 We bombed down these, hoping for more gradient downstream. Soon enough we got our wish, the creek steepened considerably and I actually hopped out in a couple of places to take a look before we committed. There were some nice steep boulder gardens in there.. Things got a little more hectic downstream. Longer, bigger boulder gardens had us scouting a few places. 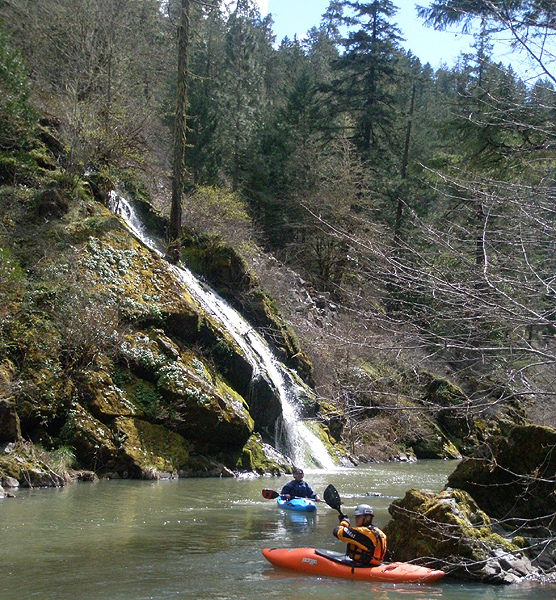 After a half mile or so the gradient cooled off and we drifted down to the South Umpqua. At this point we were all coated with smelly Elk Lake Creek water and man, I'm not sure what was in there but it wasn't natural. Maybe something agricultural from upstream. I assume that at higher water in the winter this wouldn't be as much of an issue? Not sure. 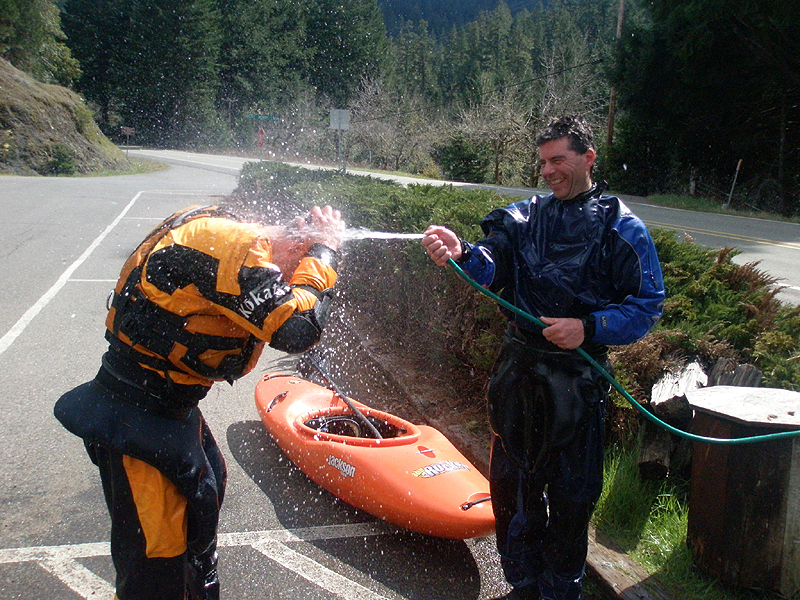 We reached the South Umpqua and I paddled out into the main flow of clear, clean water and knocked off a couple of rolls to get the Elk Creek water off, then we climbed up the bank to the cars. Luckily there was a hose at the Ranger station near the take out and we were able to rinse our gear ( and ourselves ) before the long drive home.. Washing the funky Elk Creek water off.. I think the smell was caused by some agriculture runoff upstream or something? I have no idea when this creek runs, though I imagine all the time during the winter and briefly in the spring time. It is worth doing, especially if you have a lot of water, I think it would be more entertaining with more water and I think the ag runoff upstream would be less noticeable. 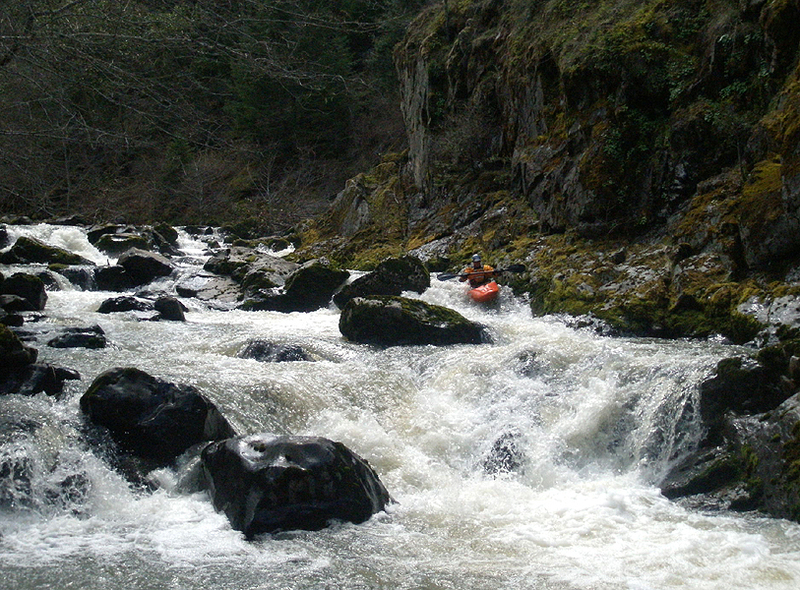 We had about 1,100 cfs in the SF Umpqua at Tiller if I remember correctly in the early Spring. Elk Creek. We took out at Tiller, put in about two miles upstream.